Programming note: I’ll publish our giant everything-you-need-to-know post about the Gold Line extension to Azusa later this afternoon. I’m an estimated two Diet Cokes away from finishing it. My Foothill Cities photo essay should post Thursday. The new NoHo-Pasadena Express crossing the Arroyo Seco in Pasadena on Thursday. Click above for more info on the new express bus. Photo by Steve Hymon/Metro. Looking from the rear of the train on the new Gold Line Extension at mid-day on a Thursday in February when traffic on the 210 was heavy but not its usual rush hour snarled self. Photo by Steve Hymon/Metro. The answer to the headline, according to the article: traffic on the 210 won’t seriously be impacted. Shocker. I think that also misses the point. I’ve yet to meet anyone who believes that come Monday morning, the new 11.5-mile Gold Line extension to Azusa will magically cause traffic to vanish on the 210 freeway. Geographically-attuned readers may know that the 210 freeway and/or Inland Empire extends many, many miles beyond Azusa. 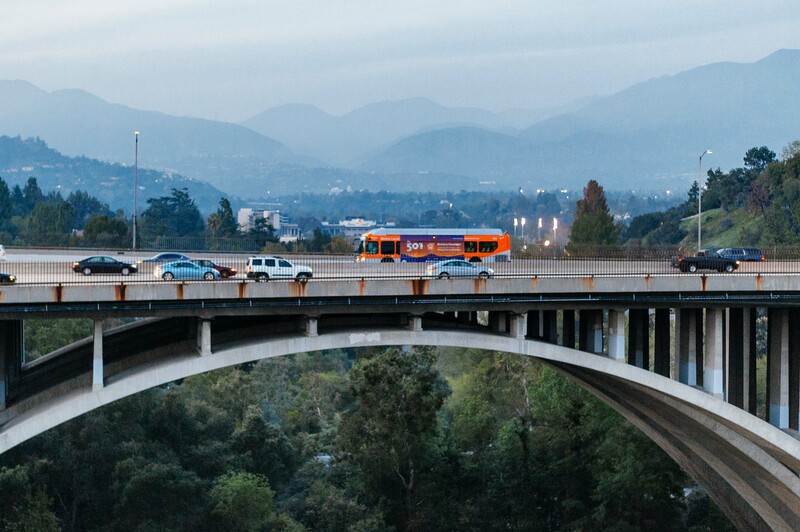 That said, I’ve met plenty of people — and heard from plenty of readers — who are pleased there will be a fast, frequent transit alternative to sitting in gridlock on the 210. And make no mistake: the 210 between Pasadena and the 605 (and beyond) is an utterly miserable experience at many times of the day and night. I should know. I’ve lived near this stretch of freeway for 13 years. As we’ve written in this space countless times over the years, cities around the world with big transit systems still have traffic. Why? Cars are popular, cars are affordable. But these cities also have something else: transit systems that give residents and visitors a pretty good option other than driving. That’s important because not everyone wants to drive, can drive or can afford to drive. •The Gold Line has seen big-time growth in ridership since the Union Station-Pasadena segment opened in 2003 and the Union-Station-East L.A. leg in 2009. There are currently about 46,000 average weekday boardings, about double the number of boardings there were in 2008. •For those who like to count the minutes, it will take 25 minutes to ride the Gold Line for the roughly 15 miles between downtown Azusa and Old Pasadena. It should nicer and quicker than sitting among the heavy truck traffic and other vehicles that constipate the 210 at rush hour. Look, people. When it comes to transportation, panaceas are few and far between. But there are plenty of nice Earthly places to visit that show that having transpo options is — shocker again! — a really good thing. The Expo Line will not lack for destinations, but if it is to put even a dent in the infamous car traffic of the Westside, it is imperative that we start the conversation on how to get better transit access for more people. As noted by the Reader, connecting two major destinations for tourists, residents and workers — DTLA and DTSM — is a good thing. He, too, has some concerns about whether train schedules will allow the line to be viable for some riders and makes some good points about the need to build better communities around the new stations. Hard to argue that vehicles are more efficient. I don’t entirely agree that Americans are driving more just because gas is cheap (averaging $1.73 nationally). I’d say low unemployment and a stronger economy are big factors, not to mention continuing suburban sprawl in many communities. Sure, New Urbanism with nicer, more walkable and denser cities can certainly be found sprouting in many communities. But I think in modern day America, those places are still the exception, not the rule. Springsteen plays three nights at the Expo Line-adjacent Sports Arena later this month — the 15th, 17th and 19th. If you’re going to the show on the 17th, I’ll see you in line for the pit, a promised land to which I’ve yet to be granted entry. Possible Springsteen and River album-oriented Metro tweets….just brainstorming here…. 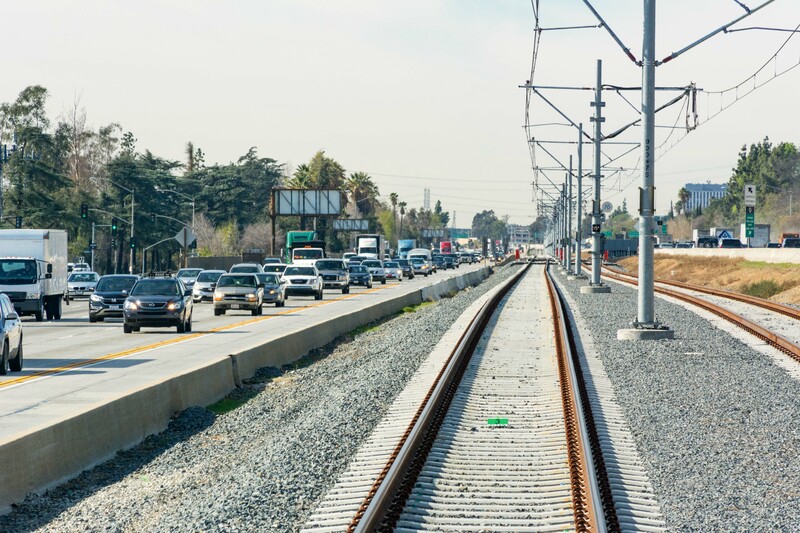 March 1: with the new Gold Line extension, what changes will come to the Foothill cities? Feb. 29: American commute times keep inching up. Feb. 25: Metro responds to Daily News’ ExpressLanes editorial. Feb. 24: how long does it take to drive from Santa Monica to Pasadena during the afternoon rush hour? Feb. 23: how many readers have used ride-hailing to get to and from Metro stations? And, a new bike path to connect the Duarte/City of Hope station to the San Gabriel River Bikeway. Maybe Metro shouldn’t be promoting the new Gold Line extension with quotes like ‘Metro Eases Traffic’. It gives the impression traffic will suddenly improve because of the new rail line. The focus should be on giving people choices to sitting in traffic. Even if everyone on the 210 freeway commuting to Downtown Pasadena wanted to park their cars and ride the train, there aren’t enough parking spaces on the Azusa extension. The 1500 or so parking spaces given to Metro riders pales in comparison to the number of parking spaces at the average Bay Area Rapid Transit station. Within the first month, maybe even the first week at some of the stations, the lots will be full, people will be turned away, and they will not be happy. So where are all the 210 Freeway signs directing motorists to Gold Line stations? It’s not so much the traffic affect, but the fact that I won’t have to drive 4 miles in it to get to a station. Heck, my car can stay in the garage. No more having to climb in through the hatchback when my car is squeezed by two SUVs at Sierra Madre station. That sounds like a fun exercise at the end of a work day, especially if you have to also climb over the back seat. What a coincidence: it’s also the one-way price you pay to Go Metro to Disney Hall.